Dutch studio Lust mixes digital space with physical reality, playing fast and loose with the conventions of interaction design. Lust, based in The Hague, exemplifies a generation of contemporary studios immersed in the vast multidisciplinary landscape of the digital. Working in graphic design, typography, data visualisation and new media, making books, posters, interactive installations and signage as well as architectural and urban works, they have built up an impressive and wide-ranging portfolio, from the Data Wall they created for Rotterdam’s main art museum, via their Scraper Type for the Museum of the Image (MOTI) in Breda, Holland, to Res Sapiens, the interactive Twitter-based installation at the Pompidou Centre in 2012. The studio was set up by Jeroen Barendse, Thomas Castro and Dimitri Nieuwenhuizen. The first two met at the Academy of Utrecht and finished their design studies together at the Academy of the Arts, Arnhem, under Karel Martens. At the same time, the American-born Castro was also working at Barlock Studio where he met Nieuwenhuizen, who was on an internship as part of his interaction design course at the Design Academy. The three quickly established themselves as a team, eventually moving into their first studio together in 1996 in an old bank vault in The Hague, equipped with just a single computer. They were already designing posters, flyers, booklets and multimedia works, notably for the Loos Ensemble’s contemporary music festivals, as well as typefaces, some of which had already evolved into façade typography projects for the glass-clad De Volharding building in The Hague. Lust have always been interested in type but, Nieuwenhuizen says, they see type as only ‘the starting point of information’. Where the traditional typeface designer is concerned with creating fixed graphic form for written content, Lust turn this around, creating dynamic form that is constantly changing depending on the content it is conveying. De Volharding building façade, using the typeface LUSTPop, 1998. 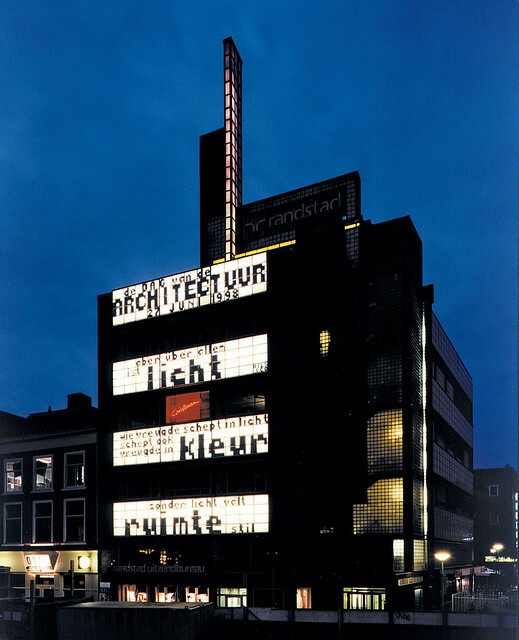 In 1996, architects Wils&Co lit up the one side for Dutch national architecture week with typography by Lust, who returned with new designs in 1998, 1999 and 2006. 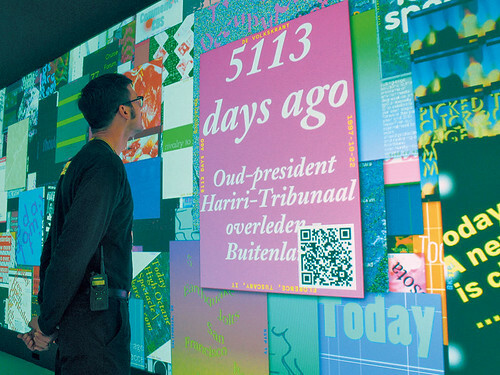 Top: Posterwall for the 21st Century, 2008-12, originally installed in Breda’s Museum of the Image. The MOTI commission Scraper Type (2006-08), for example, uses Google News RSS feeds to generate a font. You type in a search term and the application ‘scrapes’ data from the network and projects the results onto a large screen. What you see is your word constructed from these results. Lust create many of their own programming tools, which enables them to experiment in an iterative and systematic way. Design decisions are heavily dependent on this software but this keeps them concentrated on the process at hand – and means they have constantly evolving tool bases to play with. It is within this framework that they set up LustLab three years ago, an annexe to their studio activities that allows them to concentrate on researching fresh concepts. Today the studio has a permanent team of twelve designers and developers, with Nieuwenhuizen mainly running LustLab, and the other two taking care of Lust. Digital Depot (2003) was a ‘breakthrough project’. According to Nieuwenhuizen, this is when their working processes started to come together as a whole. Holland’s second largest museum, Boijmans Van Beuningen in Rotterdam, had a vast quantity of art works it could not display. Lust’s task was to find a way to ‘visualise’ the works of art as a whole – and in addition to present the works in an intuitive way, so that visitors could learn more about the collection. Initially, they spent a lot of time visiting the space and the art, getting a feel for the material. Then they drew up what became their ‘Ten commandments’ for the design process. This did not define any formal issues about the final piece, nor did it hint at what the piece may look like. Rather it was a list of ‘dos and don’ts’, a means to limit them to the task at hand. In the Digital Depot’s DataWall, content is presented via an intuitive touchscreen system of transparent glass panels. The technology was before its time, pipping in just before Minority Report startled the world with gesture-screen interactivity. Since then Lust have developed their tools and fine-tuned their approach, research for one project feeding possibilities for future ones. 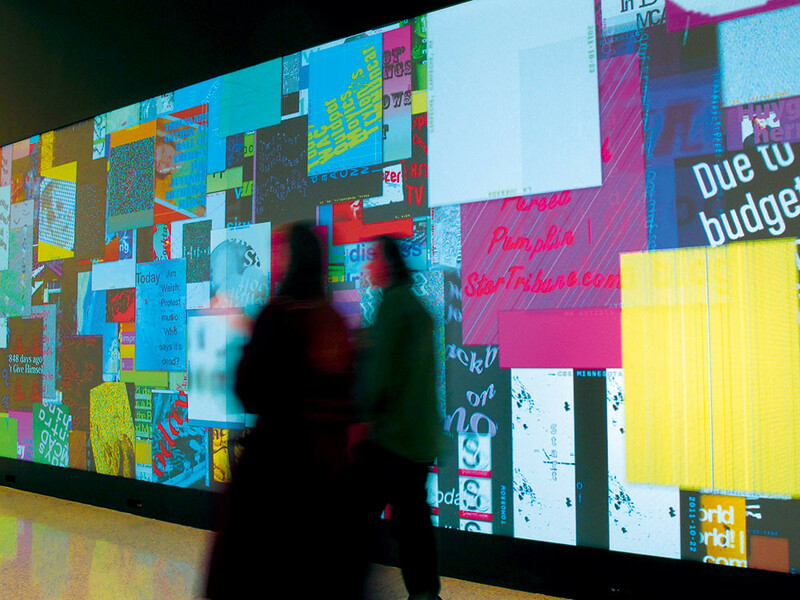 For example, in PolyArc (for the Chaumont poster festival in 2011), visitors can interact with (and add to) the projected content by sending SMS messages or Tweets. 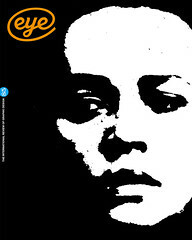 Posterwall for the 21st Century, 2008-12. The Posterwall software continuously generates ‘posters’ from news, Twitter, blogs, etc., and displays these on the wall-sized screen. Posterwall for the 21st Century (2008-12), originally conceived for MOTI, generates posters from metadata sources on the internet. In the most recent edition of this work, which is on tour in the US, Kinect technology enables interaction with visitors as they move through the exhibition space. A fascination with how one experiences the real world and virtual information leads Lust to explore ways to engage us with content via multiple levels of perception and communication. ‘We are very interested in how you can add semantic value to the interpretation of data. So not just what it is but also what it might seem,’ says Barendse. Showcased at Salone del Mobile in Milan and at 2012’s ‘Multiversités Créatives’ exhibition at the Centre Pompidou in Paris, Res Sapiens is a series of lamps that react to online data, which they filter, share and eventually act upon, shining and moving in response to each other’s findings. The installation in Paris used the stream of micro-conversations on Twitter, one lamp picking up on emotions in the vicinity of Paris, another picking worldwide opinions about trending Wikipedia topics, in a subtle incarnation of the flow of data around us. Data therefore becomes the ‘life-force’ of an everyday object. What does it mean? There is no explicit or fixed meaning, the work only engenders further questioning. How we might make use of these possibilities in everyday life is one such question. There is a Karl Gerstner dictum from 1968 that states: ‘Instead of solutions for problems, programmes for solutions.’ Lust have taken this one step further, deleting the concept of solutions and replacing it with questions. Barendse states: ‘We don’t even know what to solve. Only possibilities. Nowadays there is too much emphasis on solutions. This blocks a lot of ideas, and holds back true innovation.’ Lust’s work is therefore essentially about keeping the process going, having an open mind and letting developments lead one to new stages of inquiry through a systematic and iterative process. It’s not about embodying meaning within fixed form or solutions, it is about letting information flow towards new possibilities. Possibilities for bringing the virtual and physical closer together. And in that respect, Lust are perhaps a unique vessel navigating the digital today. Though none of us knows where it will lead, Lust is one of the design practices that is defining a new space. 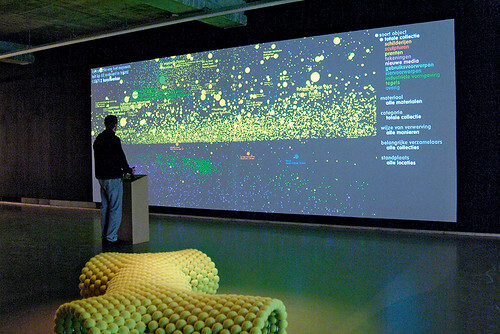 DataCloud, 2003, is a spatial data visualisation of the Museum Boijmans Van Beuningen’s collection of more than 117,000 works. Mark Webster, writer, curator, coder, Free Art Bureau & Ecole supérieure d’art & design d’Amiens, France.